We have battled a smoke problem in our cabin for a while. Recently, it reached a head, and Michelle discovered a simple, easy solution. Occasionally, we seemed to get too much smoke from the wood stove or the old water heater. Once or twice, it got so bad that a freshly lit fire retained all the smoke it produced in the wood stove, where it leaked out of every crack, filling the cabin with eye-watering smoke. We had to open windows everywhere, often letting in more cold that we could dispel with the fire! We wore filter masks until breakfast to prevent breathing the smoke. We noticed this more often after I installed the new water heater (search term “Iron Giant” in window above). Naturally, since we had to reconfigure the wood stove chimney to vent the water heater, we assumed that we had messed up the draw in the process. Homestead smoke behaving properly (Photo: Mark A. Zeiger). The final straw came when Michelle, working upstairs, saw smoke leaking from the metalbestos chimney section that runs through our upper floor. Any attempts to improve that only made it worse. Michelle had an inspiration: she went outside and looked at the chimney. She came back to report that our wind vane chimney cap was pointed the wrong way (see A Successful Bargain Hunt). By this time, thoroughly frustrated, maybe even panicked, I rejected her observation. Finally, I saw the truth of her assertion, and tried to change the situation. 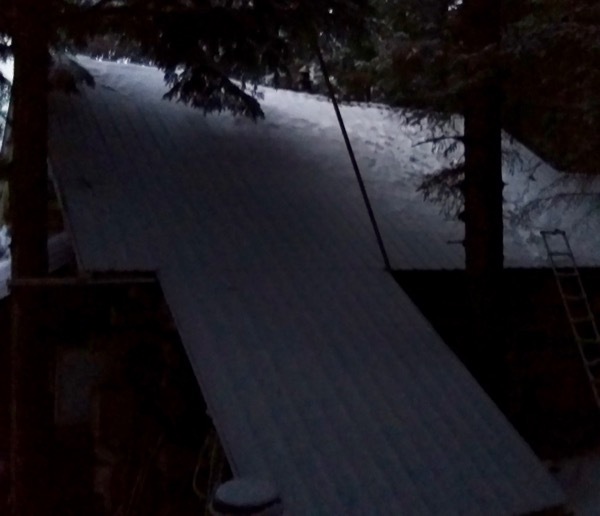 The roof was covered with snow over a layer of ice. I couldn’t risk going up on the roof, but I could reach the topper with a long pole if I stood on a ladder. I poked it into position to the day’s prevailing wind. 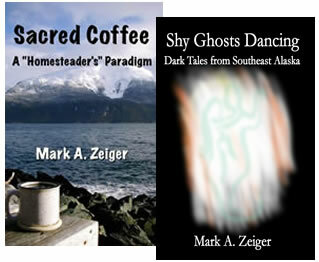 The smoking inside stopped immediately, and smoke in the cabin began dissipating through the wood stove draw! Before going back inside, I threw a line over the roof and secured it as a lifeline for the next step, whenever that might come. It came the next day. I realized I wouldn’t want to clean a hot chimney cap, so I got dressed and went after the problem in the dark, before lighting the wood stove. The marks left behind don’t adequately depict the struggle of climbing a snowy roof! (Photo: Michelle L. Zeiger). I now have much more respect for Santa Claus! With Michelle spotting me, I climbed the snowy roof, hauling myself up on the lifeline and securing my harness to the top as quickly as possible. 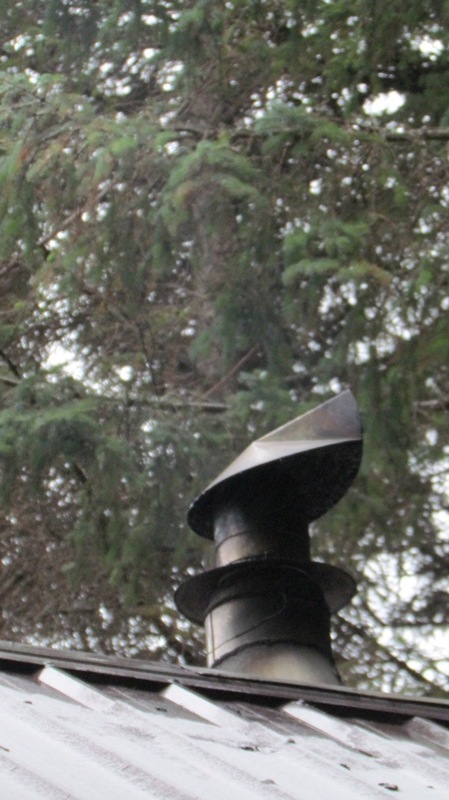 I then attacked the chimney cap with a wire brush, cleaning creosote until the topper turned fairly freely. It appears that creosote clogged the mechanism of the cap sometime in the autumn. Since it “froze” in a southerly wind, it remained in the proper position most of the time. It took the frequent northerlies lately to cram the smoke down the chimney and into our living areas, revealing our problem. It’s solved for now; the next time the roof clears during a warm spell, I’ll go back up in daylight and make sure it’s as clean as I can get it. I’m even considering greasing the mechanism. The irony here is that we voluntarily create smoke in our home! It’s still Christmas time, so we have our beloved smoking man incense burner (see Thank You for Smoking). In addition, we have peat incense from Ireland. Aly brought home a box when she first attended class there (see “I Would Bring You Ireland”). I picked up another box when we visited last autumn (see Every Sign a Song Cue) so we’ve felt more inclined to light it when we want a nice olfactory reminder of the trip. It’s hard to justify lighting incense when the house is already filled with wood smoke!